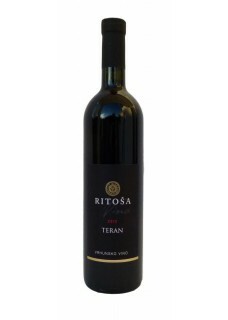 Contrary to the established opinion that Teran takes a long time to mature, this Teran is after spending one year in oak barrels great for early consumption which is result of malolactic fermentation (which Ritoša performs in all of its red wines), and the grape harvest after complete maturity. Dark, ruby-coloured wine, characterized by gentle red rose and pepper scent, mixed berry flavour, good body and freshness. Food pairing: Meat, fish dishes.